1// These J.Crew Factory skirts are the best: so comfortable (thanks to an elastic waist...genius! ), cute, and are the perfect length...enough said. Also comes in this color and this color. 2// How perfect is this bag?! A pretty spring color with scalloped details and under $35 is a winner in my book. Also comes in this pretty color! 3// A gingham pink shirt...you can't go wrong. Wear this with a skirt or boyfriend jeans for spring. Easy peasy. 4// Last spring, on a whim, I bought silver metallic pumps (like these that are less than $50) thinking that I would only wear them a couple times, but since they were so inexpensive I still bought them. I was so wrong, I wear them all the time. Metallic shoes are back in and these gold sandals are just the cutest. Need. 7// This cami dress combo is perfect for fancy nights out. I love that it looks like two separates. 8// A fun summer plaid. Also on major sale! The weekend is officially in sight which means we have to turn our clocks forward (oops-mistyped this earlier), but we get extra light in the evenings (!!!) I think Portia, the daughter of Kyle Richards from RHOB, said it best this week when she said "Hallelujah everyone!" Please tell me one other person saw that and loves her just as much as I do?! *You can shop my picks for Vol. 1 here! Most items are still available. I looove the J. Crew Factory skirts. so much. that green! I am absolutely OBSESSED with Portia. She is SOOOOO cute!!! LOVE these finds! Especially the ASOS bag! Been drooling over that for a while now! Love #7- I thought it was two separates also! Okay, these low wedges are haunting me! I saw them on IG this morning. The North East Girl was wearing them and, for the first time in a long time, I was like "I have to have these!" But...I am a little hesitant about the price, so I am going to keep an eye out for a cheaper version! That dress! These pieces are screaming my name but the 'budget' word keeps ringing in my ear. Oh well you've convinced me that I NEED that sequined dress stat ha. 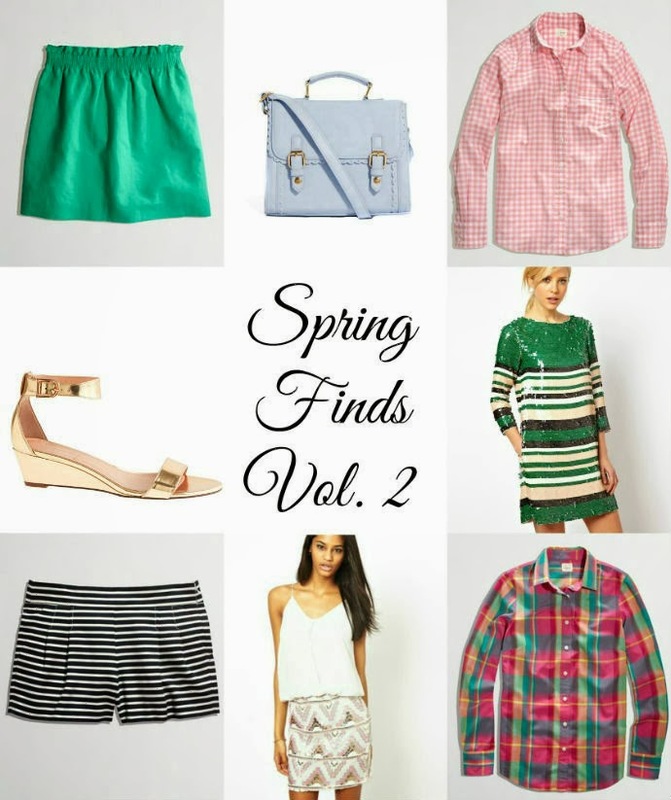 Love these spring picks! The sandals make this! Divine! So I started reading The Northeast Girl's blog because of you....and now between the two of you, all I want to do is shop shop shop! :) For some reason, I recently decided that I NEED a pink gingham shirt....but I'm looking for more of a hot pink/raspberry/fuchsia that doesn't cost one million dollars. Please do let me know if you come across one. I'm hoping Target or Old Navy will help a sista' out one of these days. Ah, I NEED that JCrew skirt! Great picks! i LOVE the green sequin dress!!!! !